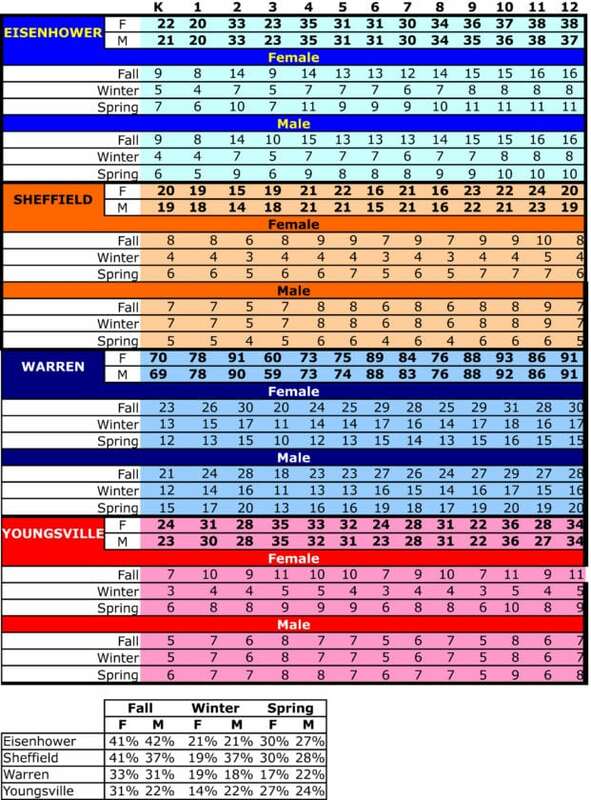 Times Observer chart School enrollment, by grade, with the average sports participation, also by grade. For grades before school sports begin (seventh grade), that number is still averaged out for an expected level of participation. For parents with children participating in athletics in the Warren County School District, the bell tolls for thee. It is mathematically improbable to field teams all four attendance areas. Let’s use, as an example, the Youngsville 7th-8th grade football team. There are 13 kids having physicals to play. The 10-day numbers will likely reflect that 11 are showing up for practice with nine actually competing. You can’t have a football team with 11 kids. It seems foolish to think you can have any football or soccer team with just 11 kids. If you take the time — which we did, the chart published below, left — to take enrollment, and then take the average sports participation by season and multiply those out, guess how many kids would historically have come out for football at Youngsville in 7th and 8th grade? If you guessed 13, you’re correct. It is time to co-op… more frequently… all across the district. As you move up to the high school level, the facts are even more glaring. It’s time for schools to admit that student populations have decreased enough that having multiple sports for each season is more often than not unsustainable. The community, the administration at each school, and the school board need to sit down and work out an acceptable plan that makes sense — for the student-athletes. Any other answer is not a solution to this problem. The board has already set minimum team sizes, and those numbers need to be revisited and enforced. In most situations, if a school can’t maintain that number, it’s time to co-op. That’s the reality we’re in. Numbers aren’t going back up dramatically. Now that we’ve grabbed your attention with sports, the thing that truly scares us, this is also happening with academics. That’s an editorial for another day — sooner rather than later. The biggest sports issue at hand, aside from low numbers impacting whether your school’s team is, well, good… or whether you have to worry about even fielding a full team… we have to worry about whether we can keep these kids in one piece. Sure, that includes soccer and all sports, but that mostly includes football and wrestling, and sports in which size and strength and age/experience really matters. Sports that numbers really matter. What happens is that coaches — even administrators — want to keep their teams alive, keep the school spirit thriving. Up and down the halls. On social media. Word of mouth. Whatever. In the end, the result has been losing.. or even winning, and at what cost? Hopefully, we will never see at what cost. But, with a smaller team (and we are talking about the numbers game here, right? ), players become less big or less older or less experienced or less talented, dedicated players. We’ve seen this for years, but we’ve had blinders on. It’s time to hear the bell. What’s the worst that can happen? We come together to solve the issue?